Below are the terms and conditions for creating and submitting your entry. Each entrant must submit a completed entry form with their entry before the 22nd of January 2018. Use of a false name or address by any competition entrant will result in disqualification. For the purposes of this competition, the entrant’s age at the time of the competition deadline (22nd January 2018) should be used to determine the appropriate age category. All entries must not include any images, sound, registered trademarks or other intellectual property that is subject to copyright of a third party without express and written permission of the copyright owner. This includes, but is not limited to, music/song clips and video clips. If you are including media of this nature in your entry, such as a song or piece of background music, you must provide written/signed permission from the copyright owner or their agent(s) with your submission. Feel free to use royalty free assets subject to specific terms and conditions of use. The Judging Panel's decision is final and no correspondence will be entered into regarding any decision. The winning entries will be published on Drugs.ie. All category winners will be required to take part in any publicity activity associated with the competition. This may include media interviews and photocalls and attendance at the awards ceremony in 2018. While copyright remains with the entrant, the promoters reserve the right to publish/broadcast or promote entries in any medium or format of their choosing. We are not in a position to send back entries. The promoters will not accept liability for loss or damage to any work submitted. All prizes are non-transferable and will only be awarded to the prize winner. The Directors, officers, employees and connected members of their families of the Ana Liffey Drug Project or the judging panel are excluded from entering. Entrants must be currently residing in the Republic of Ireland or Northern Ireland. All entrants and winners shall agree to waive any claim against the promoters, their servants or agents, for any damage, loss, injury or death. There must be clear evidence of research in your entry. To the fullest extent permitted by law, the promoters reserve the right to amend these rules and may at any time during the competition, at its absolute discretion, adjourn or terminate the competition before a winner has emerged. Submitted film/animated videos must be original works between 1 and 3 minutes in length, researched and recorded by the entrant and must not have been previously broadcast. The film or animation can be recorded on any camera, but the quality must be fit for broadcasting. Film/animated videos will be accepted by e-mail (in .flv, .mp4, .mov. wmv formats) or as a hardcopy entry on CD-R, DVD Video or DVD-R (in .flv, .mp4, .mov, .avi, .wmv formats). The email address for attachments is awards@drugs.ie. The maximum file size accepted via email is 24MB. 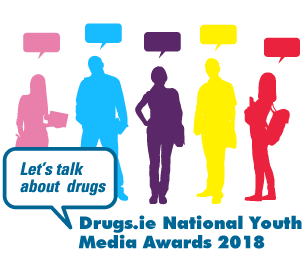 The postal address for hard copy entries is Drugs.ie National Youth Media Awards, Ana Liffey Drug Project, 48 Middle Abbey Street, Dublin 1. Any entry over 3 minutes in duration will not be considered by the Judging Panel. Submitted audio features must be original works of up to three minutes in duration - researched and recorded by the entrant and must not have been previously broadcast. Audio features will be accepted by e-mail (as MP3 or WAV files) or as a hardcopy entry on CD by post. The address for emailing entries is awards@drugs.ie. The maximum file size accepted via email is 24MB. The postal address for hard copy entries is Drugs.ie National Youth Media Awards, Ana Liffey Drug Project, 48 Middle Abbey Street, Dublin 1. Each entrant must complete the entry form appropriate to their category and submit the completed form along with the audio clip before the deadline. For the purposes of this competition, the entrant's age at the time of the competition deadline should be used to determine the appropriate age category. The broadcaster reserves the right to edit each winning audio entry before broadcast. Broadcast of any audio entry is subject to editorial approval by the broadcaster. Audio entries over 3 minutes in duration will not be considered for judging. The maximum file size accepted via email for all formats is 24MB. There are no upper file size restrictions on entries submitted through the postal service. If you send an entry through email over the weekend, you will not receive a confirmation email early the following week. The poster should be no larger than A2 (420 x 594) and can be in either portrait format (vertical) or landscape format (horizontal). You can use freehand drawing, computer aided design or a combination of both – it’s completely up to you! You can use digital images (taken by a camera or phone) and use them in your poster. You can submit your poster through email or through the post on a USB memory stick or CD_R. If mailing your entry, the maximum file size accepted via email for all formats is 24MB. There are no upper file size restrictions on entries submitted through the postal service. The address for email entries is awards@drugs.ie. All entries submitted by e-mail will receive a correspondence as confirmation of receipt - if you do not receive an email confirmation of receipt your entry has not been received so please follow up with us. If you send an entry through email over the weekend, you will not receive a confirmation email early the next week. All postal entries will receive a confirmation email when received. Drugs.ie are not in a position to return posters to the sender. The promoters of this competition are The Ana Liffey Drug Project.